We missed seeing Pen Hadow and his team mates plunge into the chilly depths of the Serpentine on a rainy day in London. Apart from a few damp spots on Pen’s trousers, they didn’t look any worse for wear. This is hardly surprising because, by all accounts they were wearing the full garb for immersing themselves in the truly icy waters of the Arctic. When I say ‘we’ I mean Monty, my youngest son, and I. He was on a half term trip to London and came with me to the press conference about the Vanco Arctic Survey. The team were a bit late and they talked for nearly an hour but Monty was gripped. He didn’t make any complaints. In fact he was thrilled when Pen asked him whether he was concerned about the plight of polar bears. I asked him why he was looking so serious. He said it was because he thought he was on live TV, which was extremely exciting…. But when we left the Royal Geographic Society, where the press conference took place, Monty asked me a question, which showed he’d been listening. He said ‘if submarines measured the depth of the ice below the surface of the water and satellites measured the ice above the surface, couldn’t these two facts be put together to get the total thickness?’. 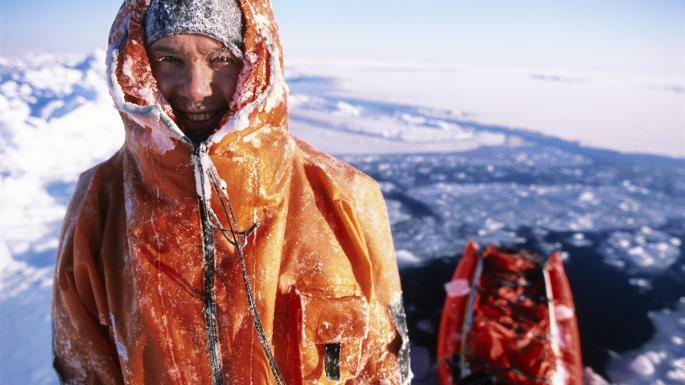 Pen had explained that the point of his next Arctic venture, in February 2008, was to take several million readings of the ice to find out how much was there. This meant measuring the density as well as the thickness – so that’s what I explained to Monty. It was lucky I’d been paying attention! To do this Pen will be pulling a boat sledge – it floats on the water and skims across the snow – and behind this will be some amazing equipment. A yellow box designed to take the readings but weighing just 4kgs, when all previous versions weighed 100kgs or more. The two other team members on this 2000 km expedition are Martin Hartley, who’ll be taking photos, podcasts and anything else that shows people what they’re up to and Ann Daniels, who apparently will be in charge of keeping them all alive. I didn’t envy her that job – presumably it means she gets the blame if they run out of supplies. I was horrified to learn that the Arctic Ocean’s ice-cap has receded by 300,000 kms each year since 2001, which is the equivalent area to the UK, Poland or Italy. And it’s predicted that the ice-cap will disappear completely by the end of this century. In fact the expected timing of this disaster varies from between 16 and 100 years. There’s a similar level of discrepancy about how much sea levels will rise in this period but considerable agreement that the impact on millions of people will be huge. The expedition is sponsored by telecommunications company Vanco. And there are lots of research partners too. We can hope that it’s successful but the worrying thing is what we can realistically hope for in terms of melting ice-caps and rising sea levels – only it seems that it takes longer than any of the predictions…. yikes. This entry was posted in BLOG, Business, Charities & NGOs, Done, Energy & Climate, News 2007, People and tagged Climate change.